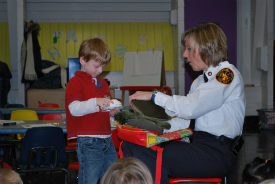 The National Fire Protection Association (NFPA) has selected Marsha Giesler of the Downers Grove Fire Department as the 2012 Fire and Life Safety Educator of the Year. The award recognizes fire and life safety educators who have demonstrated excellence and innovation in the use of NFPA educational programs. "I am very proud of Marsha and her many accomplishments," said Downers Grove Fire Chief Jim Jackson. "Downers Grove is very fortunate to have a person with so much passion and energy devoted to fire and life safety education." As the Public Education/Information Coordinator for the Downers Grove Fire Department, Giesler teaches Learn Not to Burn, a fire safety and injury prevention program for grade school children. Through a series of monthly classroom visits, students are exposed to a variety of safety topics in an age appropriate manner. The lessons learned are shared with parents to be discussed together at home. In addition to teaching children, Gielser also plans and presents safety programs for adults, civic groups and high-rise properties. As the department's media liaison, she is often on fire scenes fielding questions from the press. A nationally recognized professional in the field of fire safety, Giesler used her expertise to write a first-of-its-kind text book, Fire and Life Safety Educator, which was published in 2010. It is a training guide for fire personnel and civilians in the discipline of fire safety and injury prevention education. Though there are many things she loves about her job, Giesler's favorite part is playing Edith the Safety Clown. Dressed in her colorful uniform and rubber boots, Edith (whose name means Exit Drills in the Home), spreads her safety messages at special events such as Downers Groves Passport to Safety Day and the annual Night at the Firehouse. While Edith may be silly, the safety lessons Giesler imparts to audiences are important. Learn more about fire safety and injury prevention from Giesler and several other safety professionals at the 9th Annual Passport to Safety Day. The event will be held at the Downers Grove Park District Recreation Center on May 19, 2012, from 10:00 a.m. to 1:00 p.m.